Men's black aluminum adjustable soft touch derby handle. 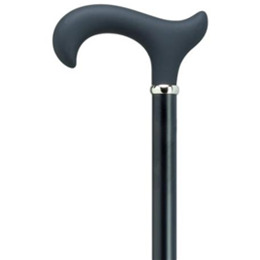 This cane is complimented with a silver tone band and an luminum anit-rattle nut for a sturdy feel . The cane adjusts from 31" to 41" is constructed with 7/8" aluminum upper tube and this product is CE certified.